Winter may be here, but the Bahamas are still warm and buzzing. 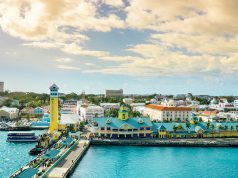 Don’t despair in the winter blues– there are Bahamian festivals to attend, Junkanoo music to hear, and tiny islands to explore. 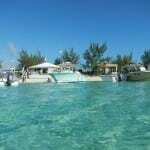 Little Farmer’s Cay is a quintessential Bahamian Out Island. First settled by a freed female slave and her children, it was permanently willed to her descendants. They can build here but not sell to outsiders. 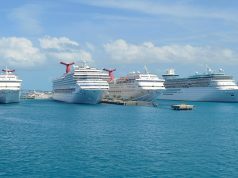 Today, it’s a small and friendly community that welcomes cruisers to an experience that feels like a step back in time. With a population of approximately 60 people, this tiny cay is quiet, relatively undeveloped, and dotted with attractive homes and lush vegetation. 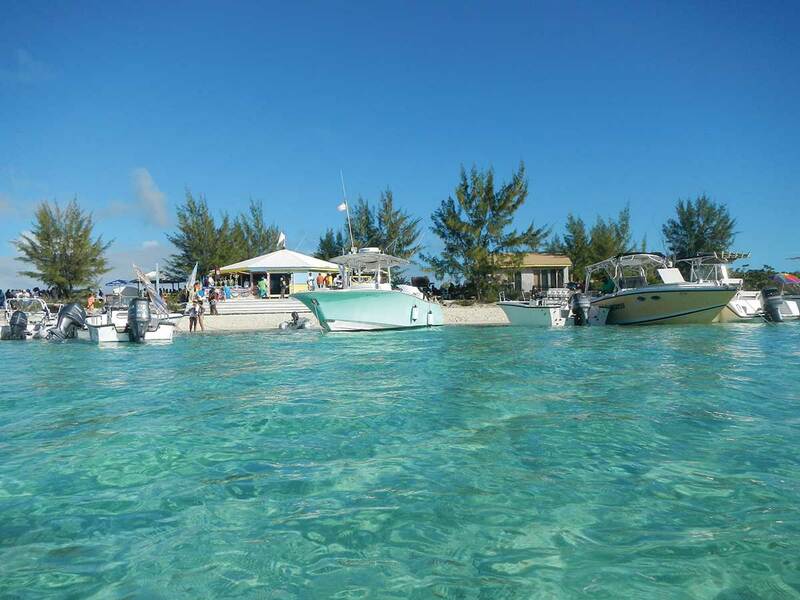 Little Farmer’s is located on the banks side of the southern Exuma Cays just 20 nm south of the better-known Staniel Cay. It’s easily reached from either the south or north on the banks side. Pay close attention to your charts, as the preferred deeper water tracks are surrounded by isolated coral heads and sand bores. Farmer’s Cay Cut offers access from Exuma Sound, but use caution in this cut. It’s wide, deep and easy to read, but a large swell from sustained easterly winds against an ebb tide can make it a rough ride. The currents are also quite strong. Dockage is available at Farmer’s Cay Yacht Club, and moorings can be rented from the Yacht Club and Ocean Cabin (oceancbn.com). The best anchorage in settled easterly winds is on the west side of the island off the beach. The first weekend in February is homecoming weekend for Little Farmer’s Cay. 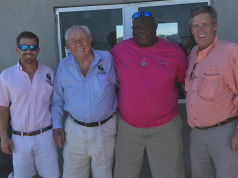 Scores of family and friends from off island converge for a celebration that includes the biggest C class sloop regatta in the Exumas. Dozens arrive Friday on the Captain C, the inter-island mail boat, which also carries many of the sloops on deck, while other visitors come by private boat or small plane. The festival has become known as The First Friday in February Farmer’s Cay Festival, hence the 5 Fs. It’s so popular with cruisers that you may find 100 or more cruising boats anchored or moored around the island for the weekend. The center of the celebration and regatta headquarters are at Ty’s Sunset Bar & Grill on the southwest side of the cay. Just outside their front door is the airport runway, which also serves as “Main Street” on this part of the island. Out the back door is one of the prettiest beaches you’ll find. 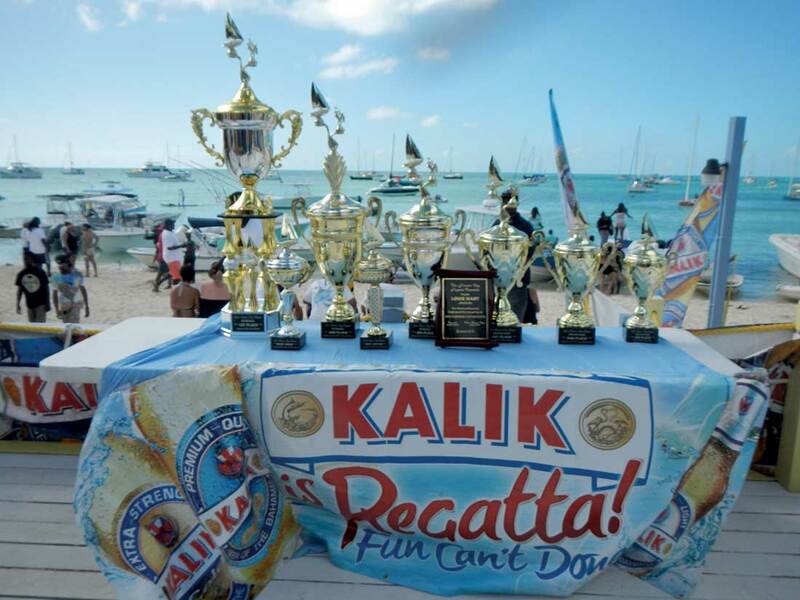 Good food, music and dancing, along with the regatta announcers and trophy presentations continue all weekend on Ty’s deck. Class C sloop racing is the spectacle that brings many of the visitors to this festival. 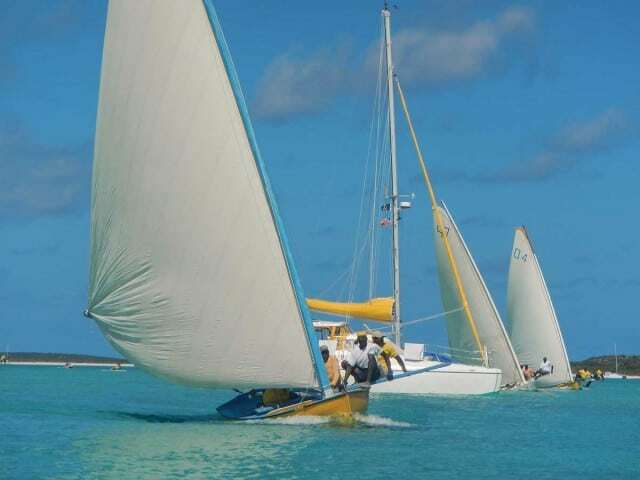 These are traditional Bahamian boats built entirely of wood and carry a single sail that looks far too big for the boat. Watching them race in a big breeze is an exciting show. 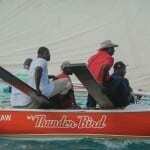 By rule, they must be owned, built and sailed by Bahamians. With that huge sail, keeping these boats upright is a challenge. The solution is to use “pry boards” or long planks that are extended out over the side. Up to four crewmen sit out on the boards to counter the force of the sail and keep the boat upright and flat for maximum speed. The unique race start is very much a part of the attraction. 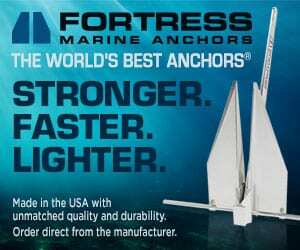 Each boat actually anchors approximately 50 feet to leeward of the start line. 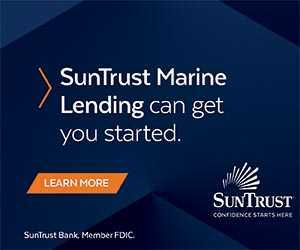 When the starting gun goes off, the crew raises the anchor and sail simultaneously, then sails as quickly as possible to the start line and upwind to the first mark. This makes for close and exciting racing at the line. The crew slides in and out on the pry boards, and when tacking they move the boards across the boat to the other side. Timing is critical because if not done perfectly, the boat can capsize. 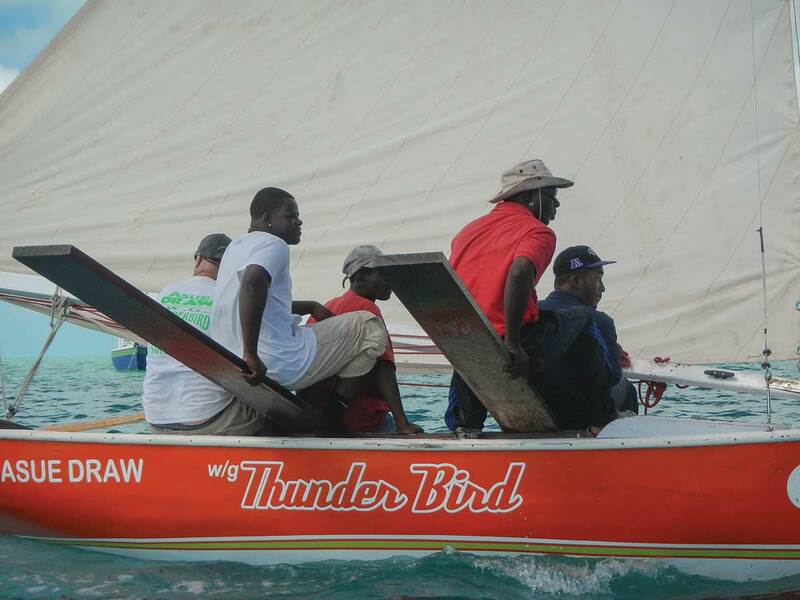 The finish line is usually set just off the beach at Ty’s for maximum spectator benefit, which means that the boats wind through the anchored cruising boats as they approach and sometimes pass just a few feet away. This makes your cockpit one of the best vantage points for the race. 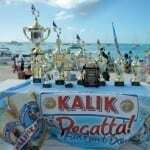 With boats from all over The Bahamas, there are rivalries going on here that, as visitors, we can only guess the origin. Captains, crews and visitors gather on the beach after the racing, and the party goes on into the evening. A massive Junkanoo Parade transforms the streets of downtown Nassau on Boxing Day, December 26th, and again on January 1st, with goombay drums, horns and fantastic costumes moving to the beat. One of the oldest surviving street festivals in the Caribbean, Junkanoo has roots in traditional African music and dates back to the 17th century. But get some sleep, because the parade won’t begin until after midnight and lasts up to eight hours. Buy tickets in advance at junkanootix.com.